Is there a better excuse for a party than St. Patrick's Day? Its whimsical nature makes people light-hearted and ready to celebrate, but there's none of the pressure of gift shopping, planning a big meal, or the elements associated with many other holidays. Your spacious and modern home at Springs Apartments is a perfect backdrop for entertaining. St. Patrick's Day has its own cherished traditions, but still allows room for creativity with decorations, food and beverage, and the rest of party planning. Here are some ideas to make your St. Patrick's Day party one that your guests will remember long after it's over. Incorporating these tips may inspire you to come up with your own ideas as well. Place a "Blarney stone" at the front door and have guests kiss it as they enter to inspire lively conversation. A DIY topiary adds an Irish countryside feel to the ambiance. Wrap St. Patrick's Day garlands around a Styrofoam ball and attach to a dowel for the "trunk". Use decorative moss or green tinsel to fill the "planter". Bowls of Lucky Charms cereal can double as decorations and party snacks. They’re magically delicious! Hide several gold-wrapped chocolate coins in different places and send kids on a scavenger hunt to build their own pot of gold. Beer and Irish whiskey flow freely on St. Patrick's Day, but have you ever thought about using it in a dessert? These Guinness, whiskey and Irish cream cupcakes incorporate an Irishman's favorite beverages and they taste heavenly to boot. Make a non-alcoholic batch for the kids. Mint milkshakes are a delicious, kid-friendly drink option. Grown-up kids can spike theirs with Irish cream or a shot of Jameson. Encourage your guests to dress in their most creative St. Patrick’s finery. Hold a contest and let everyone vote for the best outfit. Present a bag of gold-wrapped chocolate coins to the winner. Get some CDs of Irish music and songs to provide pub-like entertainment. 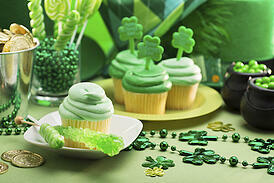 Your imagination is the best guide to a successful St. Patrick's Day party. Which of these ideas are your favorites? Share your holiday party tips with us in the comments!